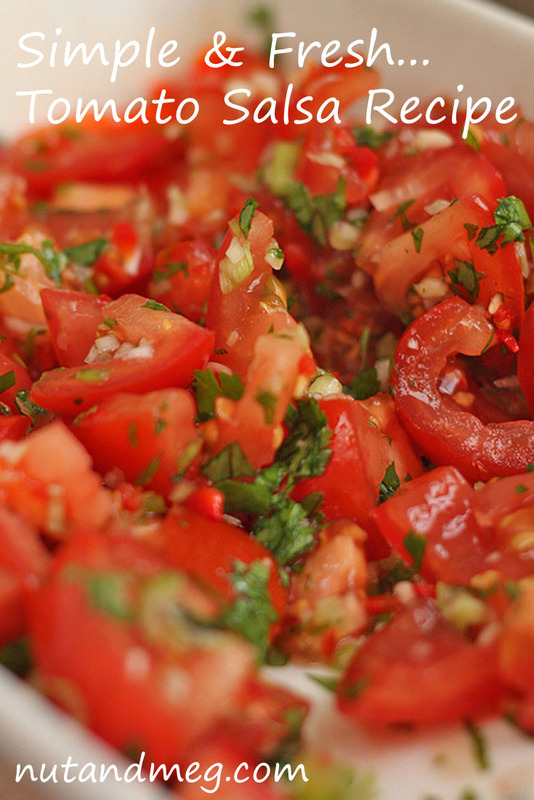 This cool salsa, even with more than a hint of fiery-chilli, is especially delicious during the summer months. And it’s very easy to make too, so there’s no excuse! We usually have it on wrap for lunch, along with some salad and rocket leaves. You could just as easily have it with nanchos or something similar. In this version we’ve used chunky tomatoes. Feel free to make yours a lot smaller, if that’s the way you like them. Fresh coriander ready for chopping. 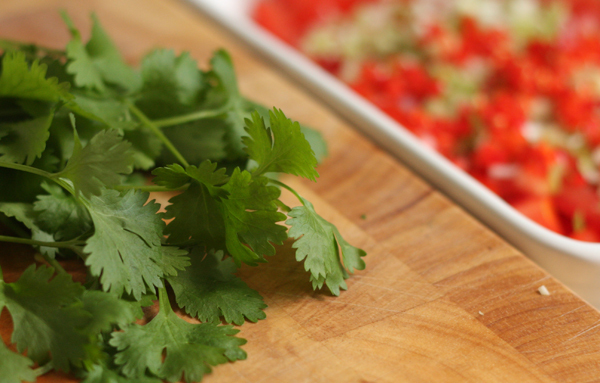 Did you know the word coriander comes from the Greek, koris, which translates as ‘bed bug’? Nice. You don’t have to use a spoon to measure out the lemon juice, a good squeeze will suffice. Lemon is a flavour catalyst – it interacts with your taste buds to enhance the flavours that follow. 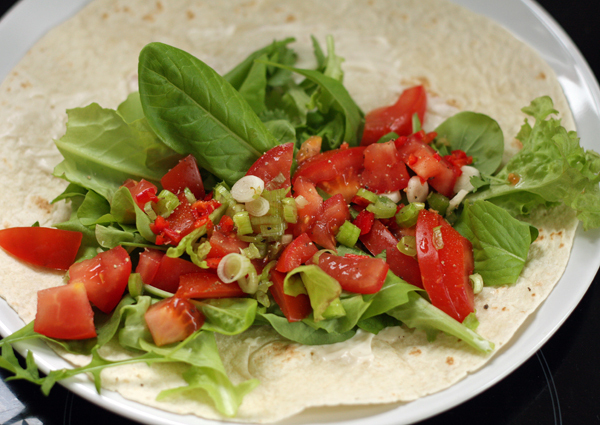 The lovely tomato salsa on a salad leaves and rocket wrap made a delicious light lunch. 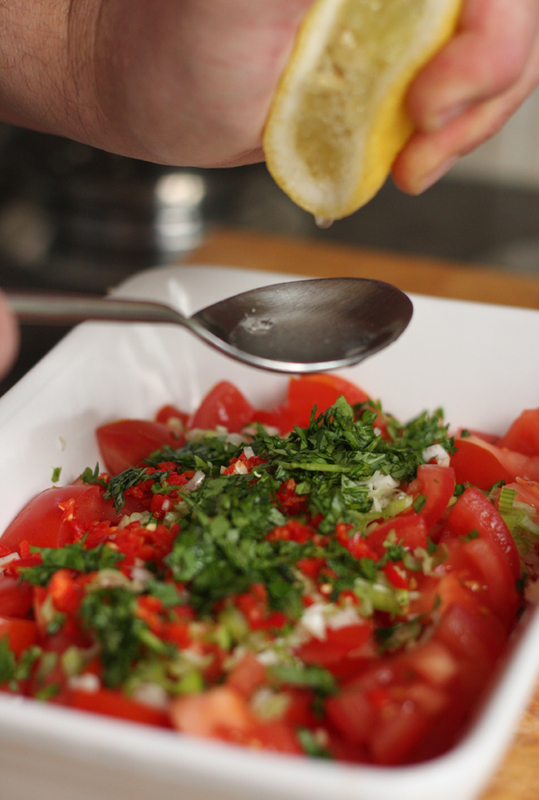 Chop the tomatoes, slice the spring onion, crush or slice the garlic and chop the coriander. Add everything to a bowl and give it a good mix up. Chilli is optional, so are the seeds. Personally, I like chilli so I throw in the seeds too. I prefer red over green. Finally, add the lemon juice, salt and pepper and put the bowl in the fridge until you are ready to eat. 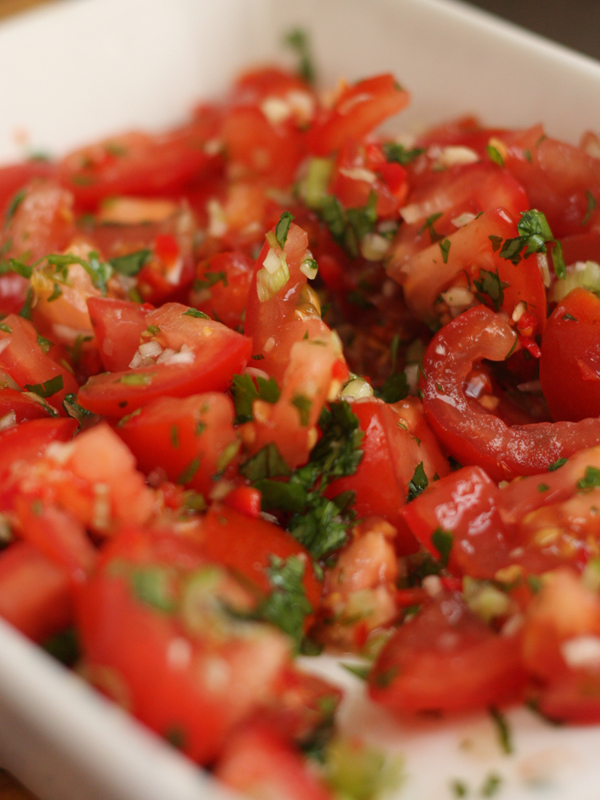 Adjust the quantities in this tomato salsa to suit your tastes (and feel free to throw in additional ingredients). After making the salsa and taking the photos, we immediately ate it on a salad leaves and rocket wrap. We took a picture of that too (see below).